If you’re thinking about attending seminary, finances are a big part of the decision. After all, you don’t want to pile up debt as you head into the ministry or your teaching career. 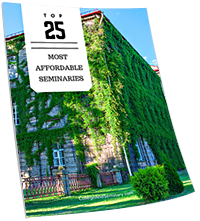 We are not suggesting you make your seminary choice based solely on which school offers the cheapest tuition, but our aim with this ranking is to highlight the 25 most-affordable seminary educations in the U.S. for 2016. Use this list as a starting point to consider some of these institutions further. To produce this ranking, we started with schools that are accredited members of The Association of Theological Schools (ATS). We then collected publically available tuition data for each of them and ranked them accordingly. Lastly, we encourage each of our readers to do their homework when researching any theological institution to ensure the core doctrinal positions are understood and faithful to historical Christian teaching. World Mission University (WMU) was established March 1989 by the Oriental Mission Church. The school is currently located in Koreatown, a center of downtown Los Angeles, California. WMU is accredited by three accrediting bodies, including TRACS and offers a range of traditional seminary degrees, including M.A.’s in Theology; Christian Counseling; and Music; M. Divinity; and Doctor of Ministry. WMU’s main goal is to prepare students who are able to accurately understand, interpret, and communicate the message contained in Scripture. WMU subscribes to the historic creeds of the church, including The Apostle’s Creed, and is rooted in the confessional tradition of Protestant Evangelicalism. New Orleans Baptist Theological Seminary (NOBTS), located in New Orleans, Louisiana, was first founded in 1917. Affiliated with the Southern Baptist Convention, NOBTS adheres to the confession of the Baptist Faith and Message 2000. The school’s main campus is located on a 70 acre tree-covered lot in suburban New Orleans; twenty extension centers also exist in the southeastern part of the country. In addition to these physical locations, NOBTS offers hybrid and online courses, providing convenient options for busy students. A variety of undergraduate, graduate, and doctoral degrees are available to choose from at NOBTS. Tuition cost is significantly lower than the national average and spouses of full-time, main-campus students are eligible for half-priced tuition. Midwestern Baptist Theological Seminary (MBTS) was founded in May of 1957 as the sixth seminary established by the Southern Baptist Convention. MBTS’s 220-plus acre wooded campus is located mere minutes away from downtown Kansas City, Missouri. Classes are offered both on-campus and online; the school consists of an undergraduate college, graduate school, and school of doctoral programs. Accredited by The Higher Learning Commission and the Association of Theological Schools, MBTS confessional commitment is to the Baptist Faith and Message 2000. Baptist Missionary Association Theological Seminary (BMATS) is located in Jacksonville, Texas. Established by the Baptist Missionary Association of America in 1955, BMATS is a theologically conservative school which unapologetically regards Scripture as infallible and inerrant. Accredited by both SACS and ATS, BMATS offers cost-effective tuition to its students. Degrees and programs that are offered through BMATS consist of M. Divinity; M.A. in Church Ministries; M.A. in Religion; B.A. in Religion; Associate of Divinity; and a variety of non-degree programs. Located in Wake Forest, North Carolina, Southeastern Baptist Theological Seminary (SEBTS) was established in 1950. SEBTS is accredited by the Southern Association of Colleges and Schools Commission on Colleges and the Commission on Accrediting of the Association of Theological Schools. SEBTS mission is to glorify Christ through the equipping of students to fulfill the Great Commission and to serve the church. A variety of programs and degrees are offered at SEBTS, ranging from associate to doctoral level, and most degrees may be completed either online or on-campus. Chapman Seminary, of Oakland City University, is located in Oakland City, Indiana and is affiliated with the General Association of General Baptists. Chapman currently offers Master of Divinity and Doctor of Ministry degree programs. 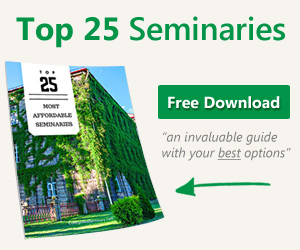 The seminary is accredited by the Association of Theological Schools (ATS). A large element of Chapman’s mission and goal is to prepare students for Christian service in the church and society. Over the last twelve years (2002-2014) the seminary has gained an impressive track record of 85% of M. Div. and 100% of D. Min. graduates having become involved in some type of vocational ministry within a year of graduation. Over 75% of these graduates still currently serve as vocational ministers. True to its name, the students, staff, faculty, and board members of the International Theological Seminary (ITS) hail from all around the world. ITS is proud of its global diversity and has been committed to keeping the word “International” in its school name since its establishment in 1982. Though students are admitted from all backgrounds and denomination, ITS, as an institution, holds to Reformed Theology and instructs students from this view. Though a small school, ITS puts a large focus on missions, seeking to equip and train global leaders and is authorized to enroll non-immigrant alien students. Located in El Monte, California, ITS is accredited and offers graduate level degree programs including M. Divinity; M. Theology; M.A. in Theological Studies; and D. Ministry. Urshan Graduate School of Theology (UGST) is located in Hazelwood, Missouri and is owned and operated by the United Pentecostal Church International (UPCI). Founded in 2001, UGST is committed to the infallibility of scripture and the school’s purpose and mission is “to serve men and women from the UPCI, as well as the larger apostolic movement.” Accredited through the Association of Theological Schools (ATS), UGST offers degree programs in Master of Divinity; Master of Arts in Christian Ministry; and Master of Theological Studies. Puritan Reformed Seminary (PRS) is located in Grand Rapids, Michigan. A confessionally Reformed institution, PRC holds to the infallibility and inerrancy of Scripture and is affiliated with Heritage Reformed Congregations and the Free Reformed Churches. Established in 1995 under the leadership of seminary president Dr. Joel R. Beeke, the main goal and mission of PRS may be summarized as to prepare men for the gospel ministry; develop a student’s biblical understanding; equip students in teaching, ministry, counseling, and leadership skills; and to provide faithful workers for Christ and His kingdom. Three degree programs are offered at PRC: Master of Divinity; Master of Arts in Religion; Master of Theology. Mid-America Reformed Seminary was established 1981 and is located in Dyer, Indiana. A small school, Mid-America’s student/faculty ratio is 6:1, giving students a more personal connection with their professors. Though closely associated with confessional Reformed and Presbyterian churches, Mid-America is not governed by any particular denomination’s rules or regulations, but is rather governed by its board of trustees. Mid-America holds to the historic reformed confessions of the Church, including the Heidelberg Catechism, the Belgic Confession, the Canons of Dort, and the Westminster Confession. The school’s purpose is “to train men for the gospel ministry of Jesus Christ” and the school is committed to “providing solid theological training”. Degree programs are available in Master of Divinity and Master of Theological Studies. Central Baptist Theological Seminary is located in Shawnee, Kansas and was established in 1901. Central’s mission is to prepare “women and men for seeking God, shaping church and serving humanity.” Under the leadership of President Molly T. Marshall, Central places a large emphasis on global outreach and missions; students visit Thailand and Myanmar (Burma) as part of two of Central’s programs and have served in internships in Kenya, Hong Kong, and Haiti. Accredited by The Higher Learning Commission’s North Central Association of Colleges and Schools and The Association of Theological Schools, Central offers graduate level degree programs in Doctor of Ministry; Master of Arts; and Master of Divinity. Reformed Episcopal Seminary (RES) was founded in 1887 as a theological seminary for the Reformed Episcopal Church – a denomination which was first established in 1873 in response to development of the Protestant Episcopal Church. Located in Blue Bell, Pennsylvania, RES is distinctive in its commitment to the inerrancy of Scripture and its adherence to reformed theology and evangelical beliefs, worship and polity within the Anglican tradition. RES places a strong emphasis on pastoral ministry training and seeks to “educate and train Christians for lay and ordained ministries in the church of Jesus Christ.” RES offers a three year, highly interactive Master of Divinity program. Alliance Theological Seminary (ATS), a school of Nyack College, was founded by Dr. Albert B. Simpson and is centered in metropolitan New York with extensions throughout the nation and worldwide. ATS became a seminary in 1979 and is currently the national seminary of The Christian and Missionary Alliance. Dedicated to preparing servant-leaders for worldwide mission and ministry, ATS focuses on spiritual, biblical and theological, and missional formation in a student and is committed to equipping “for the ministry of the gospel of Jesus Christ and the expansion of His church.” Accredited by the Association of Theological Schools, ATS offers degree programs in the areas of: M. Divinity; M. of Professional Studies; M.A. Biblical Literature; M.A. Biblical Studies; M.A. Intercultural Studies; and D. Ministry. Houston Graduate School of Theology (HGST), located in Houston, Texas, is the leading provider of theological education in Houston and Southeast Texas. Offering more course options at different times, in each of its full terms than any other school, HGST has awarded over 800 degrees and currently has 200 enrolled students. An institution with a rich Quaker heritage, HGST’s student body is made up of representatives from 17 nations. Offering a variety of graduate degree programs, including M. Divinity; M. of Theological Studies; and D. Ministry, HGST is accredited by the Association of Theological Schools (ATS). Knox Theological Seminary, located in Fort Lauderdale, Florida, was established in 1989 by Dr. D. James Kennedy under the guidance of Coral Ridge Presbyterian Church. An independent evangelical seminary committed to the Reformed tradition, Knox accepts students from a wide range of denominational backgrounds. Knox’s mission is to “train men and women for full-time gospel ministry and to enrich and enable all laypersons who seek to become more knowledgeable and effective in their own personal ministries- preparing leaders of the 21st century.” Accredited by the Association of Theological Schools, Knox offers degree programs in the areas of M. Divinity; M.A. Biblical and Theological Studies; M.A. Christian and Classical Studies; D. Ministry. Lexington Theological Seminary (LTS), located in Lexington, Kentucky, is an ecumenical seminary and the oldest and pioneer theological school of the Christian Church (Disciples of Christ). Established in 1865, LTS is accredited by the Association of Theological Schools (ATS). The school holds to a non-discrimination policy; 135 students are currently enrolled, representing 29 states. LTS offers classes on campus and online, with degree programs available for Master of Divinity; Master of Theological Studies; Master in Pastoral Studies; and Doctor of Ministries; certificate programs. The James and Carolyn McAfee School of Theology, a school of Mercer University, is located in Georgia. Accredited by the Association of Theological Schools (ATS), McAfee holds to a non-discrimination policy. Built on ten founding principles, McAfee’s vision is to graduate “ministers whose passion for God and neighbor leads Christian communities to integrate head and heart, worship and witness, tradition and innovation, responsible theological inquiry and prophetic vision.” McAfee offers three main degree programs: a 90-credit hour Master of Divinity program with seven track options; a 57-credit hour Master of Arts in Christian Ministry; and Doctor of Ministry with eight specializations. Moody Bible Institute (MBI), of Chicago, Illinois, was founded in 1886 by the well-known American evangelist, D.L. Moody. Moody Theological Seminary (MTS), a school of MBI, offers seminary degrees at both the institution’s Chicago, Illinois and Michigan campuses as well as online. MTS’s mission is to “equip people with the truth of God’s Word to be maturing followers of Christ who are making disciples around the world.” Degrees offered include M. Divinity; M.A.’s in Biblical Studies; Clinical Mental Health Counseling; Ministry Leadership; Intercultural and Urban Studies; Spiritual Formation and Discipleship; and Biblical and Theological Studies. MTS is accredited by the Association of Theological Schools (ATS). Carolina Graduate School of Divinity (CGSD) is located in Greensboro, North Carolina and was established in 2003. CGSD’s mission involves a commitment to “exploring life in the spirit; equipping students with the tools they need to interact with biblical and theological literature; enhancing the ministry skills of those God has called to shepherd his people in the twenty-first century.” The school is accredited by the Association of Theological Schools (ATS) and offers the traditional seminary degrees of: Master of Arts in Biblical Studies; Master of Arts in Ministry; Master of Divinity; and Doctor of Ministry. Southwestern Baptist Theological Seminary (SWBTS), located in Fort Worth, Texas, is one of the largest seminaries in the world. Since its founding 1908 the school has commissioned and trained over 42,000 graduates. The stated mission of SWBTS is to equip “men and women with a strong theological foundation to fulfill God’s calling on their lives.” A large variety of graduate and doctoral level degrees are offered, covering categories of Theology; Evangelism and Missions; Church and Family Ministries; and Church Music. Special programs are also available for women’s ministry roles and specifically for wives of seminary students. Over 3,000 students are currently enrolled, representing 46 states and 40 countries. SWBTS is accredited by the Association of Theological Schools (ATS). Wesley Biblical Seminary (WBS), located in Jackson, Mississippi, was established in 1974 for the purpose of preparing pastors to serve within the Methodist tradition. Built upon the pillars of Trinitarian Holiness; Spiritual formation; and uncompromising Biblical Orthodoxy, WBS operates under the belief that mere academic training is meaningless apart from a life-transforming relationship with the God of the Bible. As a result of this understanding, WSB is committed to engaging not only the head, but also the hands and heart for Christ’s service. Low student/teacher ratio to allow students to develop meaningful relationships with their professors and WSB offers both Master of Divinity and Master of Arts degrees.